I don't have to tell you how susceptible newborns and young children are to colds, dry skin and other complaints. I mean, it seems like every week there's something new, right? And this only gets worse in winter, where harsh, dry air leads to sore throats, dry, itchy skin and stuffy noses. Babies are much more vulnerable to these problems, being congestion prone with weaker immune systems, and considering how prevalent colds are in winter, it's always smart to take every precaution against them you can. You need the best humidifier for babies. This goes double when you have twins, because you can bet your life that as soon as one of them gets something, the other one will too! In this post we look into the different types of baby humidifiers and which one might be the best option for you. Humidifiers for babies are pretty simple in operation, actually. They all work along the same lines, with a tank of water and some method of dispersing it into the air, increasing the humidity of the room that you've put them into. There are four major types: warm mist humidifiers, impeller humidifiers, evaporative humidifiers and ultrasonic humidifiers. The major bonuses of these is that they are cheap to buy, and super quiet when they're running. They can also come recommended by pediatricians, because the warmer air they emit can be good for killing micro-organisms and opening up airways. However, because they contain a hot heating element to raise the temperature inside, they can pose a burning hazard, and this is something you're going to have to take into account when you're placing it, to make sure it can't fall or tiny hands don't go exploring. Impeller humidifiers use a spinning disk, like a tiny fan, to basically throw tiny droplets into the air to humidify your room. They work fine as humidifiers, but have the major problem of dispersing any bacteria or micro-organisms in the water you're using into the air, which then gets onto skin and into lungs. It's for this reason that we don't recommend impeller humidifiers for use in nurseries. Evaporative humidifiers work by drawing water up into a wick system, then blowing it from that wick into the air with a fan. Whilst this is the most natural way to disperse water into your babies nursery, they're more prone to failure and incredibly loud as they're running, which can interfere with a decent night's sleep. We personally recommend these for use in nurseries. Using a high frequency sound far beyond the range of human hearing, they vibrate the molecules in the water and cause it to turn into a mist. They might be a little bit more expensive up front, but you save that money in the long run because they don't need any filters for the water; a major expense in all other types of humidifier for babies. But Isn't There a White Dust Problem? You might have heard that ultrasonic humidifier for babies leave white dust everywhere, and it's a huge pain in the behind to clean even after a few hours of use. In our experience, nothing could be further from the truth. Most good ultrasonic humidifiers have built in demineralisation cartridges which pull the vast majority of minerals from the water before it's expelled as mist, which deals with this problem. Obviously, you can't remove all trace minerals from water, so it's still normal to have the tiniest amount of white residue nearby after leaving it on all night, but it wipes up with one swipe of a cloth and leaves nothing long term. Even if this bothers you, it's easy enough to fill it up with demineralised or distilled water, which can go even further toward eliminating this problem completely. And just in case you're worried, this dust is completely harmless, so searching fingers and mouths aren't going to cause any mischief. Why Do Babies Need Humidifiers? There's a few great reasons why you might need one. It's not something you're likely to need in the first few weeks after you give birth, but in our opinion it's still worth picking one up when you can. After all, you never know, and it's something you are going to use in the long run, so you lose nothing by buying early and storing it in the cupboard. So why buy a humidifier for babies anyway? 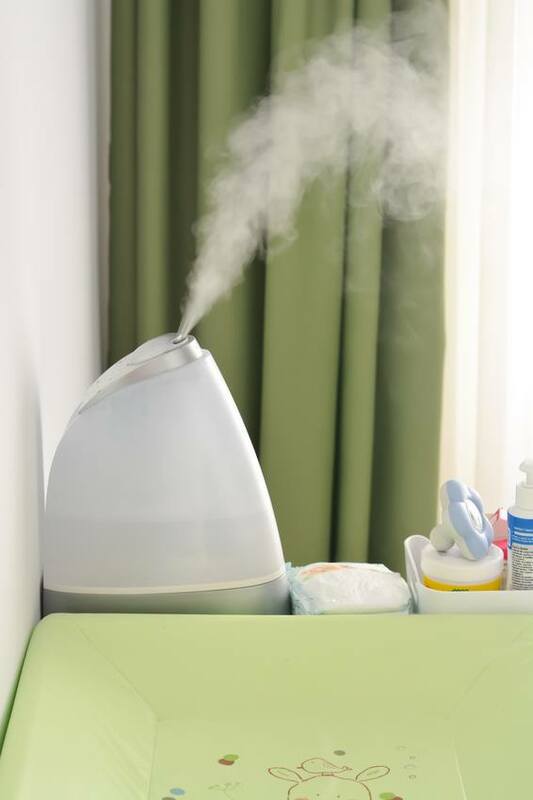 Humidifiers, especially ones aimed for babies and young kids, usually have built in features that can help them sleep. Firstly, the white noise really helps your babies sleep, especially when they're younger. Second, a lot have built in night lights and low lights that can bring a nursery to a low, relaxing set of shades. The ability to control humidity hugely helps to fight against mold and the problems mold can cause, like asthma. They are incredible at helping lessen the effects of congestion, colds and other respiratory problems. Rooms that are too dry or humid make these issues far harder for your body to deal with, and the smaller breathing channels of a babies nose and mouth mean they suffer from these problems far more. Skin conditions like dry skin, chapped lips and dry eyes are easily caused by parched, dry air. Increasing the humidity of your nursery will go a long way to fighting these problems. What Should You Look for in a Humidifier? Consider how quiet it is when it's working. Bear in mind young babies will actually appreciate white noise, so don't worry about this. Pay close attention to other noises though, like dripping, mechanical sounds or beeping, because these are the things that could wake up sleeping tots. How Long Does It Last and Does It Have an Auto Shut Off? You're probably going to be leaving your humidifier on all night in your baby's nursery, so it's good to pick something up that's going to last all night. If it isn't going to last all night, then make sure it has an automatic shut off. Most good brands will have this feature, but it's still worth making sure, because a running humidifier with no water in it can damage itself. Is It Adjustable in Any Way? Most have different settings, for example only running for half the time, and some of the more expensive models actually have sensors and an adjustable humidistat, which will only turn it on when it's needed. How Easy Is It to Refill and Clean? If you're using it regularly, you'll appreciate a humidifier that's simple to refill, without splashing or getting water everywhere. It's also good practice to clean your humidifier every week or so, to make sure it's pristine and prevent mold or bacteria from growing in the areas that don't experience any water flow. Being able to take it apart and get right into the components is good here. Does It Need Cartridges or Costly Components? Most of our recommendations are ultrasonic humidifiers, so this isn't something you're going to have to worry about, but it's still something to consider, especially if you don't choose something we like. Does It Have Any Options for Your Babies, Like Nightlights? Obviously, this one isn't essential, but it can add to the atmosphere of a room. Some baby humidifiers have multiple color options that will add the finishing touch to any nursery, no matter how it's decorated. The fact that this tiny little device is about the size of your iPhone doesn't mean it's not packed full of features. An ultrasonic humidifier that also doubles as an oil diffuser, if you regularly use essential oils around your house you'll definitely appreciate the fact that you can spread scents across your rooms with just a few drops at a time. It's still perfectly suited for nurseries, though. The fact that it's so small means you can fit it anywhere, plus the 7 different colors and nightlight are ideal for keeping your little one's room the right light level as well as humidity. It's also super cute to look at. It's got programmed cycles including an intermittent use mode, and an auto off feature, which is good because it only last 6 hours with a full tank, one of the few downsides of this model. Apart from that, it's quite fragile, so don't go throwing it around. If you want a humidifier that's capable of handling any normal sized rooms and comes with every option we recommend, there really is no better model than this one. With a large tank and a long running time of up to 16 hours, if you've got a larger house or a particularly large nursery, this model is a good choice. Ultrasonic, the rotating nozzle and adjustable speed controls that mean you can get the exact amount of hydration where it's needed, which goes well with the size of the reservoir. Once you've got this set up the way you need it, it's incredibly easy to just turn it on and leave it all day and night. It's easy to refill, too, which is nice when you've got such a large amount of water going into it. Anything less than this could be really unwieldy and hard to use. There's a couple of minor downsides, though. One, the buttons that turn it on and adjust the settings are loud and obtrusive, so make sure you don't use them around anyone who's trying to sleep! It's also quite fragile, so be gentle when you're moving it. Apart from that though, this is an amazing humidifier, especially if, like we've already said, you're looking to use it in larger sized rooms. The only non ultrasonic model in our list, this Vicks brand humidifier is a warm mist type, so keep it away from young ones because there's a higher possibility that they could hurt themselves on the heating element. If you can deal with that, though, there's a lot to love. It's got all the standard features, including a night light and automatic off when it's empty. But it's going to take a lot to empty, with a huge one gallon tank that takes at least 12 hours to empty on the most powerful setting. It takes more cleaning than an ultrasonic model, so you'll be glad to hear that this one is really simple to take apart. You can get right into it and make sure that everything is completely pristine before you put it back together again. The real differentiating factor though is the fact that you can use medicated vapors in the water! We all know what Vicks do. I think everyone's mother rubbed vaporub on their chest at some point in their childhood, but with this humidifier you can disperse it straight into the air, which is so so good when your children (or even you) have coughs and colds. Whisper quiet, with an easy to read LED screen right on the side that tells you exactly what's going on with your humidifier and with your room, Taotronics humidifier is a good choice for anyone who wants something a little more technical. Even if you aren't the most tech savvy mom though, don't be put off. It's actually very simple to use, with a simple set of buttons you'll get the hang of in just one go. There's a built in humidistat, as well as full mist and humidity control, which means that you can set this exactly to the level you want your room to be and know that it will keep it exactly where you want it to be, so your babies are going to get the most comfortable sleeping environment possible. It's also got a really good working time, with around 15 hours of humidity from the one gallon tank. Whilst it's not the prettiest we've ever seen, as the most adjustable of our list, this humidifier for babies is perfect if you're looking for absolute control, on top of the whole list of solid features it already comes with. Cute, petite and really well put together, Anypro's baby humidifier is a really sweet little system that's got a lot to recommend, and a few really irritating quirks that just set it back from being the best there is. First, I've got to mention the running time. It lasts forever. Literally an entire day or more, depending on how you've set it. It's made well, with solid plastics that have built in antibacterial and antifungal effects, keeping everything clean. Which is good, because this is actually a real pain to clean. You can't get inside it, so you have to try and work around all of the holes and then just leave it to dry. It's got a night light, which is really soft and lights up whatever room it's in beautifully, and can be set to several colors, too! I wish I could say this was the top humidifier for babies but it isn't. It's still really good though, especially if you can deal with the cleaning side of it, so if you're looking for one that you can just set and forget, then take a close look at this one. 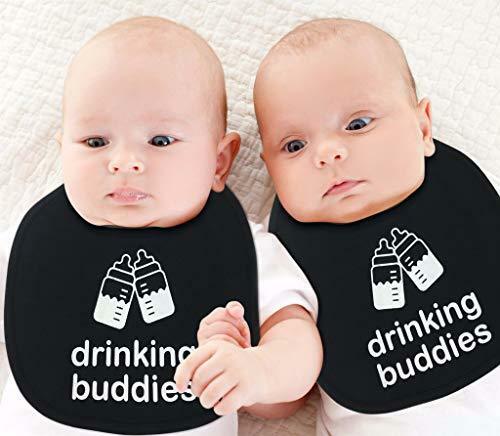 Did you know we have our own forum for parents raising twins? Join our community today and join in the discussion! No matter what you're looking for, there's the best humidifier for babies out there for you. Do you have any tips or advice on keeping your nurseries at the right temperature and humidity? Any secrets you'd like to share with us from hard earned experience? We'd love to hear about it, so let us know in the comments below.